In this dynamic era of technology, there are few direct competitors who fight straight in the industry such as Samsung and Apple, are in bitter competition. Intel competes with IBM but, there is a cold war running between 2 companies that are Google and Amazon. The world’s most popular search engine and the other is an online eCommerce store, is in an intricate relationship for years. Primarily, it was a cloud battle, but now they have moved much forward in multiple areas of competition. This rivalry disclosed with the act of Google when it forced amazon to remove its app from Google play store. This open war resulted in the launch of the Amazon app store that enables users to download app to their smart phones and other devices. Well, that clearly indicates that Google consider Amazon as a strong competitor because, logically people do not see the Amazon as such, but when it comes to search, people definitely look for Amazon as a place to buy products. The first point of parity between these two giants is that they accumulate the large data. Google collects large data and stores in data centers, which is used by users for searching, while Amazon collects data of products and services by online retailing. When it comes to media, they both compete head to head. Few of the examples are: Google Play & Amazon Kindle, Google Express & Amazon Prime and etc. Organizations who want to promote their brand or Website, can take benefit from any of these platforms by utilizing online advertising facility. What’s the Point of Difference and Comparison? Amazon is a giant for online shopping and serves millions of customers. Amazon prime shoppers have reached the visits level of more than 300%. Google is regarded as a synonym of search and information and has been serving as a leader in the search engine for about a decade. Amazon sponsored products allow sellers to place products and pay only when shoppers click on the ad. This ad program is quite similar to Google’s Product Listing Ads in which organic search results appear on the basis of keywords or products appear alongside the search results. 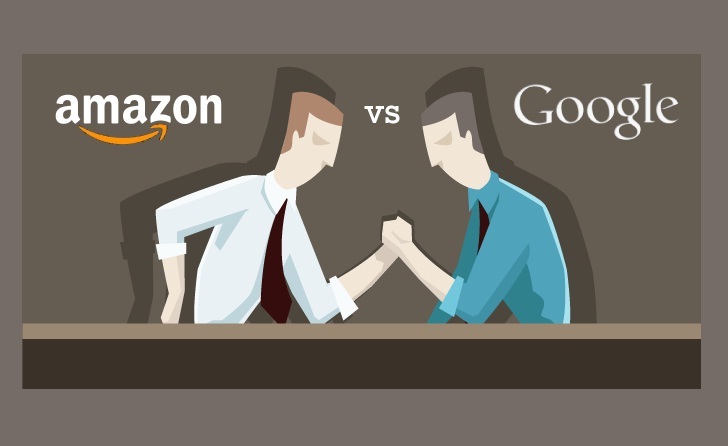 Despite of the prominent position held by Google, there is a straight competition between Amazon and Google. A research consultancy unveiled the results of a survey that third of online users start their product online search on Amazon while, 13 percent start their search from search engines like Google. Android Comes with Google Play as a downloading platform, but now Amazon is also in the competition with its Amazon App store named which works on the model of the third party app store. The work environment at Amazon is extremely dynamic and demanding in nature. Workers are rewarded for their performance and the healthy competition is promoted among the employees to compete. The staff is strictly scrutinized and accountable for their work performance that they need to accomplish in a highly competitive environment. On the other hand, Google has more innovative and cheerful working environment where the human operations are at the core. It hires people who are thoughtful and provide a flexible environment to polish their creative skills. That is why Google has set the unique culture which is world famous. There is an argument regarding too many facilities provided to employees at Google that, so many favors and benefits may transform creative employees into lazy ones however, no such case has come across that authenticate this criticism. Google Home is a voice controlled speaker that let you ask anything even a more specific question to Google. Everytime Google Home responds very quickly. More or less similar product is offered by Amazon known as Alexa, Echo which also responds to voice commands immediately which are simple in nature. As far as price is concerned, when AWS reduced its price by 5% , Google fought back with the claim that its machine type is still 15% to 41% less expensive than Amazon’s current price reduction. Amazon AWS and Google Cloud are two platforms of web services. Amazon AWS offers wide variety and high quality of service with specific tools. While Google’s offerings are quiet, smaller and limited to Iaas and PaaS services, but Google excels at storing big data where Amazon is lacking. Google cloud has a very clean interface of the management console, while Amazon has played its cards on a variety of instance types and reserved purchasing plans. Both have their own features and one can choose as per their priorities. One more area where both of the competitors can be compared is the music streaming of Google play music and Amazon Prime music. The Google play suggests a playlist for the use of current time and provides specific PlayStations. However, it lacks in sharing of social platforms. On the other hand, Amazon prime music provides small catalogues and it’s a part of Amazon’s membership scheme. You can create your own playlist by adding more albums to your library. This thing is very clear that Google makes most of its revenue from its online advertising platforms and at this stage battle between these two giants become interesting. Amazon is also planning to get into advertising by introducing its DSP technology that braces and analyzes the customer purchase behavior. Despite the Google’s efforts to push each competition behind, Amazon is on its way to establish its position and compete with online advertising platform. There is no agreement that who is giving the tough competition, eventually time will tell. But no doubt, this battle has led to the invention of many new products and services offered by both of the companies against each other. Along with this, there is a lesson for other companies who might get an inspiration from them and come up with a more differentiated value in the industry.